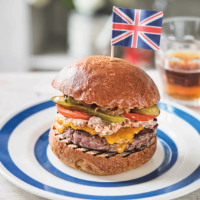 A Britburger filled with big British flavours – bacon and Worcestershire sauce mayo, malt and beer-caramelised onions. What’s not to like? 1. Make the bacon mayonnaise by combining all the ingredients together. Then reserve. 2. For the malt and beer onions, melt the butter in a medium-size pan over medium heat. Add the onions and cook until lightly caramelised and golden. Stir in the malt syrup and beer, and continue to cook until most of the liquid has evaporated. Then reserve. 3. Cook the burgers according to the pack instructions. Place the cooked burgers onto a cooling rack over a tray, and top with a slice of Red Leicester. Place under a preheated grill until the cheese begins to melt. Then transfer the burger onto the bottom half of the brioche bun. Add a couple of slices of tomato and dill pickle, then some of the mayonnaise, piccalilli and malt and beer onions. Serve with Heston's triple-cooked chips (see recipe) and the bacon mayonnaise on the side.